Malayakkovil is a small hamlet in the Thirumeyyam taluk, lying on the Pudukkottai-Namanasamudram-Ponnamaravathi route and nearly 16.5kms from Pudukkottai. The first approach in the village is the temple tank and the hillock with its monuments in the backdrop. The hillock houses two rock cut shrines; one on its southern precipice and the other one on its eastern precipice. The rock cut cave on the southern precipice is mandapa type while the eastern one is simply a cellar with rock cut extension in the front. 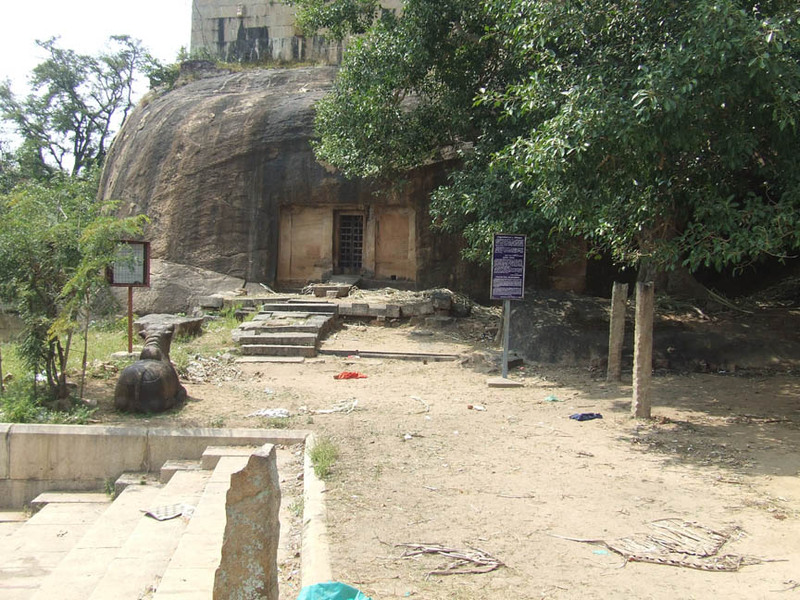 The rock cut cave on the south houses the deity Okkaliswara and the eastern rock cut cave though anonymous at present, the inscription mentions the deity as Srivaramudaiya Nayanar(1). Stone blocks are arranged to form a platform in front of the rock cut shrine to reach it. In the open space a nandi is placed facing the sanctum. The anterior wall of the shrine is 3.78mts width and has an adhishthana, bhitti and prastara. The adhishthana is padabandha type formed on either side and in the middle below the entrance two small rock cut steps are formed to reach the sanctum. But the adhishthana and the steps are partly inhumed by the stone blocks arranged in the front and on the south the components of jagati, octagonal kumuda, gala complex and pattika are visible. The rock cut steps are overlapped by a stone slab. The adhishthana itself is partly formed in which the kumuda remain incomplete, upari kampa is absent and the pada is shown only for the corner pilasters in the gala complex. Above the adhishthana raises the wall sectioned by four pilasters with the components of square, kattu, square and the octagonal kattu is long comparing the squares. The middle pilasters are damaged at their base and a stroke is shown on the face of the northern corner pilaster and the middle southern pilaster. The aperture to the sanctum is formed between the middle pilasters to a height of 1.84mts and 0.88mts width. Jambs, lintel and sill are arranged above the rock cut entrance. Jambs and lintel are ornamented as lotus petals in the ridges. On either side of the entrance spaces are formed between the pilasters. The potikas that rest above the pilasters are angular and taranga with patta and the intersecting taranga is extended as a contour scroll on the face of the potika. The single limbs of the potikas extend inside forming a vaulted space and bear the uttira above. The vajana buffer the roof and the wall. The spaces on either side are 1.92mts height to a width of 0.90mts in the south and 0.93mts in the north and to a depth of 0.09mts. Inscriptions are inscribed over the walls of the niches.2 The mother rock extension in front is 0.55mts in the south, 0.27mts in the north and in the roof the extension range between 0.36mts-0.59mts. The roof extension forms the kapota of the sanctum in which the canopy is well formed. The cubical shrine cell is 3.26mts in the north-south and 3.22mts in the east-west directions and the height is 1.96mts. The sanctum houses rock cut Linga in the center. The avudaiyar is octagonal with a circumference of 4.75mts and the height is .66mts. It is shown as a padabandha adhishthana with the components of jagati, rudra kumuda, kantha flanked by kampa on both side and pattika. The gomukha is facing north and a rampant yazhi is shown bearing it.3 But the yazhi formation is only on the east face, it is absent in the west face. The rock cut bana is 0.67mts height. The pit below the gomukha is being closed and a small hole is tunneled on the northern side of the anterior wall as an outlet. 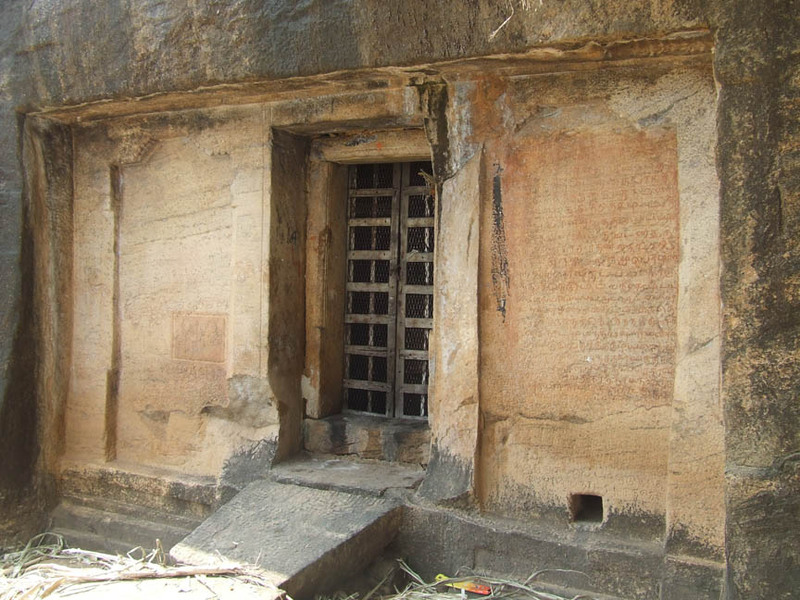 A rock cut Linga is carved inside a niche in a rock boulder that lies in front of the shrine. 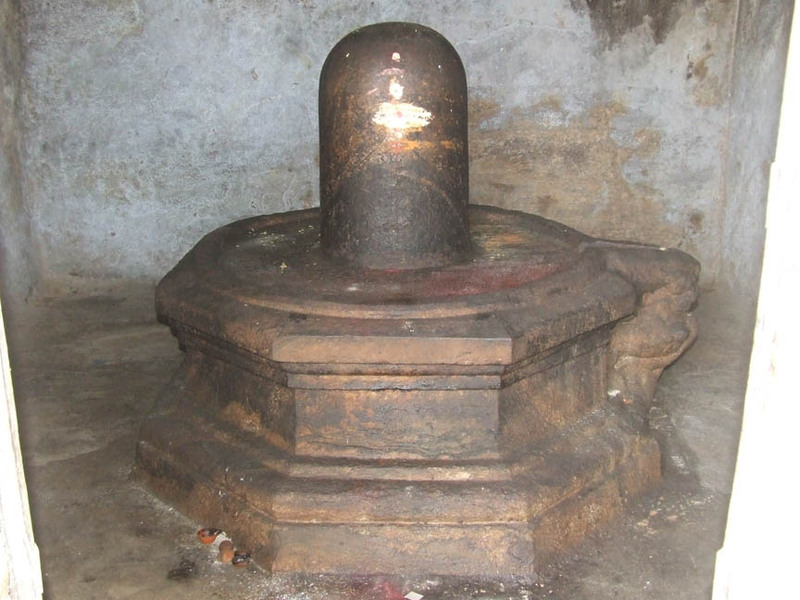 The niche is 0.58mts height and 0.75mts width and housing the Linga which is 0.43mts height. To the north of the rock cut cave on the eastern face of the mother rock a niche is seen to a height of 1.27mts, width of 0.99mts and a depth of 0.60mts. Both the northern and the southern spaces4 are adorned with inscriptions. The inscriptions on the southern space is published under No.4 in IPS, has three sections in it. The first part is the grantha inscription ‘Parivadini-da’5 inscribed inside a rectangular frame.6 Besides, two other Tamil inscriptions linked to the above said grantha inscription is found below.7 The term ‘Parivadini-da’ in same style and script also found at three other places viz., Thirumerrali rock-cut cave of Kudumiyanmalai, Sathyagiriswara and Thirumeyyam upper rock-cut cave. 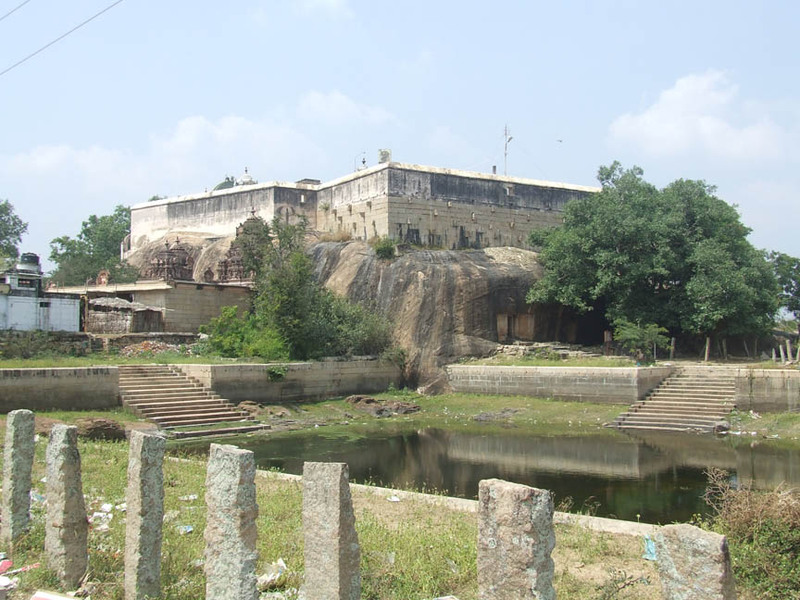 In addition Kudumiyanmalai also possess musical notations and the same has been deleted in Thirumeyyam to which its traces are found on the mother rock in Sathyagiriswara complex. These three places are contiguous to each other and it is understood that this tract must be great centers of teaching and learning Music. The inscription on the northern niche belongs to the 3rd regnal year of Jatavarma Kulasekara Pandya which begins with his prasasti ‘Puvin kizhathi’. It speaks about the cancellation of tax dues like antarayam, vari, kadamai to the devadana lands of Sri Varamudayanayanar by one Kalvayil Nadalvan. It mentions the deity as Sri Varamudayanayanar in Kananadu under Virudhurajabayangara valanadu alais Kanadu. 1. Field study on 19-02-10, 13-06-10. 2. சு.இராசவேலு, அ.கி.சேஷாத்திரி, தமிழ்நாட்டுக் குடைவரைக் கோயில்கள், (Cave Temples of Tamil Nadu) பண்பாட்டு வெளியீட்டகம், சென்னை 2000. 'வடகோட்டத்தில் பல்லவ கிரந்தத்தில் அழகிய கல்வெட்டு ஒன்று காணப்படுகிறது. இதையடுத்து பெண் ஒருத்தியின் புடைப்புச்சிற்பம் முற்று பெறாத நிலையில் காணப்படுகிறது'. P.147. The Grantha inscription is on the southern niche and the traces of bas-relief sculpture of woman is found nowhere. 3. 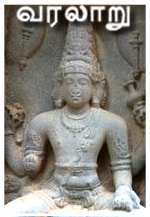 Soundara Rajan, K.V., Rock-cut Temple Styles : Early Pandya Art and The Ellora Shrines, mentioned it as simha-vaktra varimarga. ஜெ.ராஜாமுகமது, ஆவணம் 19, "புதுக்கோட்டை மாவட்ட குடைவரைக்கோயில்கள்", 2008. mentioned it as lion. P.174. 4. IPS, Inscriptions No.4, 246. 5. Mentioned by scholars as seven stringed musical instrument. 6. 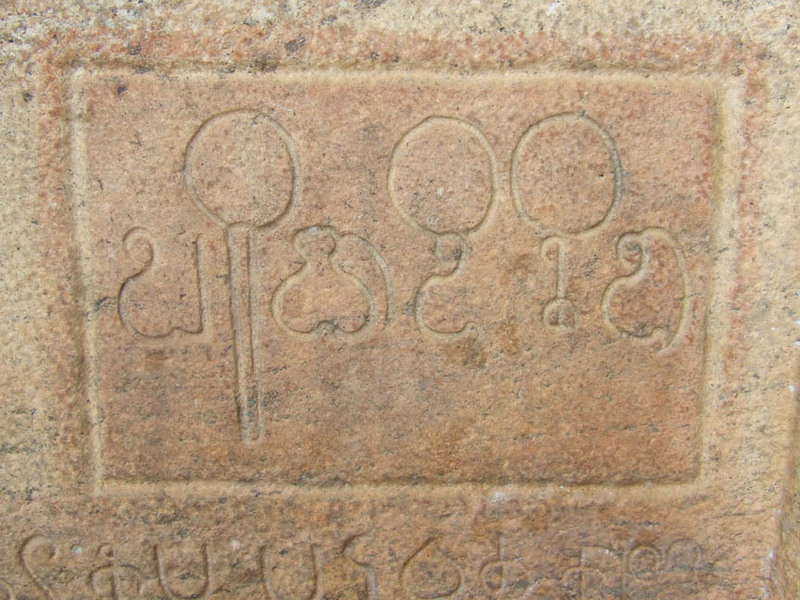 Double outline is shown in Kudumiyanmalai, Thirumeyyam Sathyagiriswara and Upper rock cut, but in Malayakkoil single outline is shown. 7. ibid., Soundarrajan K.V., according to the author ‘the small cave was used by a different set of worshippers as otherwise the larger cave would have sufficed and lead us perhaps to the Mahesvara ascetics and the Pandya predilection for their cult’. The author didn’t clarify in what context he meant the term ‘small cave used by different set of worshippers’. As both the caves possess same cult object and hence it might have attracted same category of worshippers.